Here we go! While traders at banks that illegally fixed markets to the tune of £billions are allowed to laugh in the face of the law, illegal workers in care homes, factories and farms etc. face having their pitiful wages confiscated. I have met and got know people in most of these categories, and especially the third category, in which they come to work in places such as the care homes I visit in the course of my own job. Their stories are usually full of courage and tragedy. I would not swap lives with any of them. I would swap Cameron’s life with all of them! Cameron’s approach is so crudely thought through that it is virtually unworkable – which is the the closest I can get to saying anything positive about it. Most of the people it is targeting are, or soon will be if not already, living in the shadows. I have worked with people whose working visas have expired. They have been working in the car sector tending to our frail senior citizens, dealing daily with severe dementia and incontinence, for less than the minimum wage, on zero hours contracts (if contracted at all), with working days well in excess of 12 hours. They generally cannot afford to rent more than a room, with that sometimes shared, and generally look to spend as little of their meagre income as possible so that they can send it home to relatives in even worse circumstances than themselves, often including their children that they have left out of desperation to try and find a way of supporting them. This can mean that when their visas run out, they generally have not got the means to even finance a return home. For some a return home is a return to a living nightmare of oppression, persecution and destitution. In these circumstances, choosing to disappear, to fade into the shadows, is their only realistic option. No one can be sure exactly how many people live life in the shadows. But among the congregation was a 52-year-old woman who says her plight has driven her to contemplate suicide. Bavani Amrithalingam came to Britain from Sri Lanka in 2010 – she says to avoid persecution. When all of her appeals to stay were exhausted she too simply disappeared from the authorities. With no home or job she relies on temples and the generosity of others for food. She says she left her children behind to try to make a life for them in Britain but this is not how she dreamt it would be. Unable to get a proper job, Bavani cooks and cleans for people she knows within the Tamil community – in return sleeping at their houses. Bavani is a former Tamil activist. Despite the trauma of being separated from her children she believes if she returned to Sri Lanka her life – and theirs – would be in danger. Yet she lives in limbo because the UK authorities have told her she must leave – but have failed to do anything about it. It’s difficult to know exactly how many illegal immigrants are in Britain. In 2009 the London School of Economics estimated the figure was between 417,000 and 863,000. There’s been no major study since. THEY DEVELOP RIGHTS HERE!! I don’t know who told him that, and if he he is right, it won’t so much longer if Cameron and his fascist scumbag mates have anything to do about it. 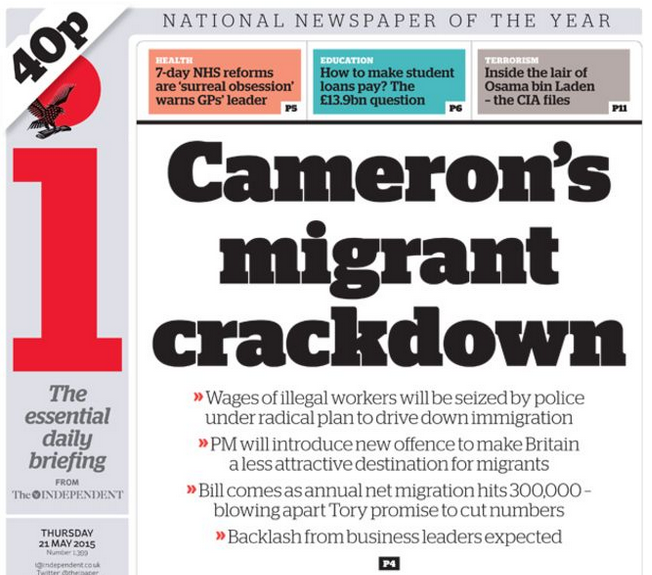 Ironically, the most effective backlash to this pogrom is likely to come from Cameron’s business chums. They revel in a plentiful supply of cheap, low-skilled labour. It keeps costs down and profits up for God’s sake!! It is not as if it is costing British jobs as the Tories are constantly reminding us that unemployment is falling (thanks to zero-hours contracts and driving down of wages), so from the business point of view, if it is working for them, stop meddling David! So given this state of affairs, the only reason for this campaign is the ideological war on the poor that is part of the Tory genetic make-up. This entry was posted in Uncategorized on May 21, 2015 by Bridgend's Green Leftie.